“So this is about pot, right?” Kimmel asked, prompting Clinton to crack up. But the joke was an opportunity for her to clarify her stance on decriminalizing marijuana, which is more reserved than that of Senator Sanders’. Unlike Sanders, she doesn’t support decriminalizing the drug at the federal level. 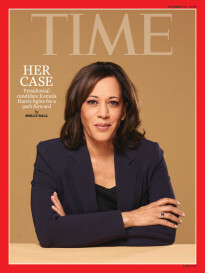 She went on by saying that she wants to place marijuana on a “lower schedule” — it’s currently a Schedule I substance, alongside heroin — to permit further research into its potential medical applications, rather than diving headfirst into the decriminalization process. “There’s some great evidence about what marijuana can do for people who are in cancer treatments, who have other kinds of chronic diseases, who are suffering from intense pain … but I want us to start doing the research,” she said.